No crazy hybrid tube amps. Didn’t sell my car to buy high-end studio monitors. Just the essentials. At home, I’m usually listening on the Sonos or the Beyerdynamic 990s + Fiio E17. If I’m feeling hipster, I may hook the 990s up to the Pioneer SX-3600—but it’s more to watch that beautiful fluoroscan display dance than for a high fidelity listening experience. You can have the best music equipment in the world. But if you can’t listen to the songs you want, it doesn’t matter. I tend to bounce between a number of services because there is no one service that can do it all, though the top selections continue to improve. The Bottom Line: Spotify has an unfair advantage in my rankings. 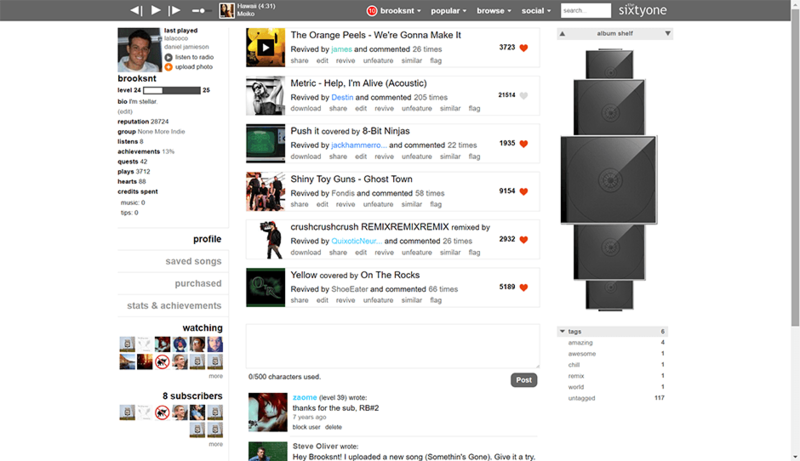 First, it’s the purest illustration of the Grooveshark business model available today. Then, throw in the service’s many nods to digital music’s piracy roots—the downloadable desktop client, three column table layout, dark interface—and you can probably see why much of my affinity for Spotify is sentimental. But nostalgia alone does not a good music service make. And Spotify is far from a relic. In fact, no other music service future-proofs its offering better than Spotify. Between its beautiful, well-organized interface, Pandora destroying “Discover Playlists,” massive list of third-party integrations, including a partnership with hardware juggernaut Sonos, Spotify just oozes indie coolness as the Internet’s best all around music streaming service. In my book, it’s enough to keep the service on the throne. Why You Should Use Spotify: Any given week, The “Discover Weekly” playlists can disrupt your entire music world. Before Discover Weekly, I could go weeks without finding a new song I liked. Now, I rarely have enough time to listen to all the new music I find through this feature. And if you go with Premium, you can listen to all of it at 320 kbps. Why You Should Use Something Else: Spotify’s selection is far from perfect. Many high profile artists and albums are missing, though which ones change all the time. Also, even though there is a web interface, most of the focus is on the downloadable client—and not everyone wants a desktop-based music player anymore (I personally love it). The Bottom Line: Spotify has been my number one recommended music site even before Grooveshark shutdown. But Google’s service, after a slow start, is catching up. Catalog size, streaming quality, Sonos integration, material design, mobile app, offline listening, ability to upload your own music—all there and all up to par. Throw in YouTube Red, essentially Ad-free Youtube + Premium Music Videos, and you have a real case for a new best bang-for-your-buck music streaming service. 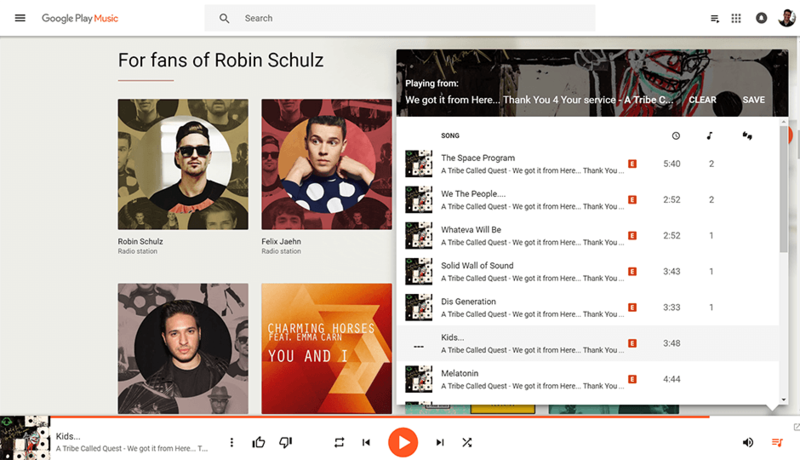 Why You Should Use Google Play Music: Feature for feature, Google is at par or better than nearly every other service available. Not to mention combining a music streaming service with an ad-free Youtube (which in itself is already one of the largest music sites in the world) makes for an extremely compelling offer. Google acquired Deezer to improve its automated playlists—which are not only pretty good, they are nearly endless with the ability to listen to playlists by genre, location, music type, mood, etc. Why You Should Use Something Else: This is Google, the company that is taking over the world. This is the same company that loses interest and shutdowns projects whenever they feel they are getting too far from their “core.” Who knows where music fits in Google’s “core,” but if it does hit the chopping block, what happens to all your playlists and stored music? 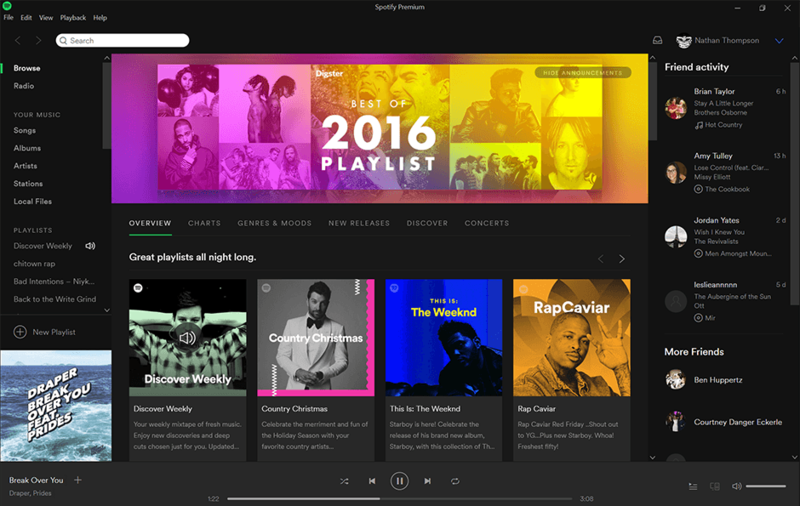 If you’re a big fan of Spotify’s interface, the Google design may not be for you. The Bottom Line: Pandora is the Grandpa on this list. I have Pandora stations older than some of you. And as one of the pioneer’s of legal, music streaming, Pandora understands what people want from a music service: As. Little. Work. As. Possible. What they built to accomplish this is the world’s most impressive radio station, where you pick your musical direction and they take care of the rest. What helped make it so good, especially in the early days, is they use music “experts” combined with the real-time rating system to build stations you can’t help but like. Why You Should Use Pandora: Though Spotify’s Discover Playlist feature has closed the gap, you’ll be hard-pressed to find a more reliable way to immediately start listening to new music you like. And if you’re like me, and have a few stations you’ve been curating for years, you understand that having a dialed in Pandora station is next to priceless. 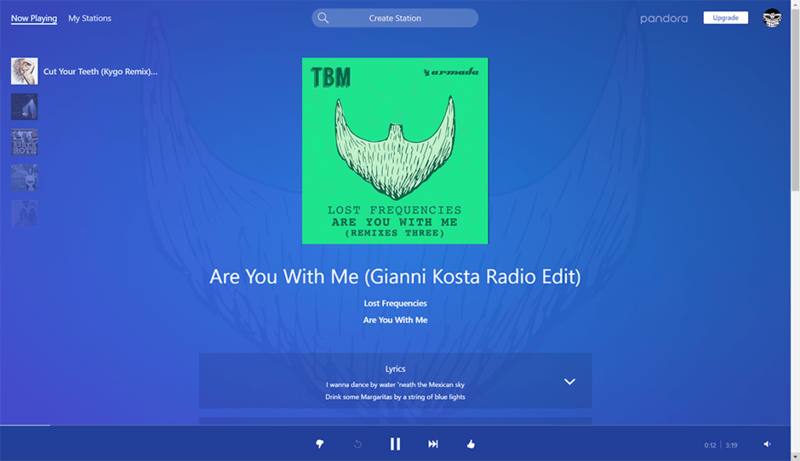 Why You Should Use Something Else: Unfortunately, the radio station analogy doesn’t stop with the music, as Pandora also rolls in some of the most invasive audio ads you can imagine for users on the free platform. Also, if you like to control the music streaming experience from start to finish, Pandora is probably your worst option. Sure, you can skip songs you don’t like (a lot of them if you’re paying for Pandora One), but at the end of the day, you’re never going to be the one choosing the music. The Bottom Line: I personally think SoundCloud is at a crossroads. In the next few years, they’ll either get the magic formula figured out and blow up into the web’s most popular music streaming service, or they’ll lose momentum through botched “pay-to-stream” strategies and loss of indie coolness, and go the way of Grooveshark and the like. It is, by far, one of the best places to discover new EDM and hard to find remixes. 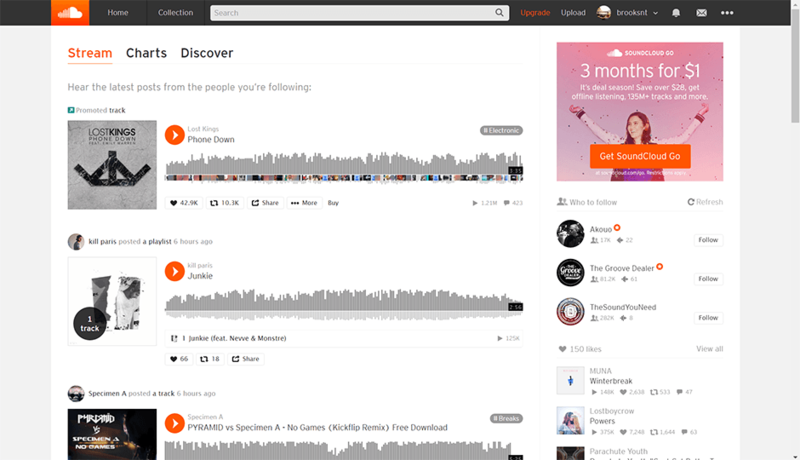 A lot of artists will test out new material or drop new singles on SoundCloud, so if you like to be in the know, it’s a good place to hang out. It lacks organization. I know that’s such an old man thing to say, but the layout has that Twitter-esque fire hose of information feel. What’s new quickly replaces the old in a new is better than what’s best type of scenario.